This unusual image reveals the aftermath of a catastrophic collision between two galaxies, which happened about one billion years ago. The result? 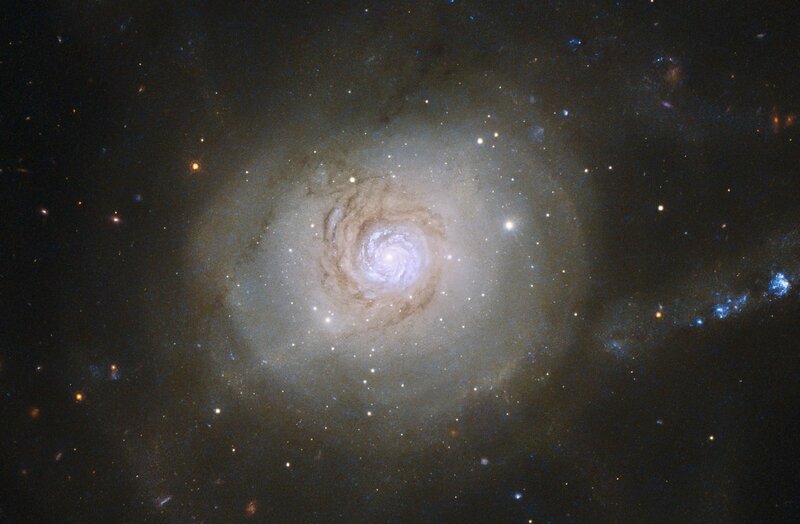 A single, very oddly shaped galaxy named NGC 7252, and curiously nicknamed the Atoms for Peace galaxy. At the heart of this merger remnant lies a fascinating “minispiral” — a rotating disc of glowing gas, bursting with star formation. 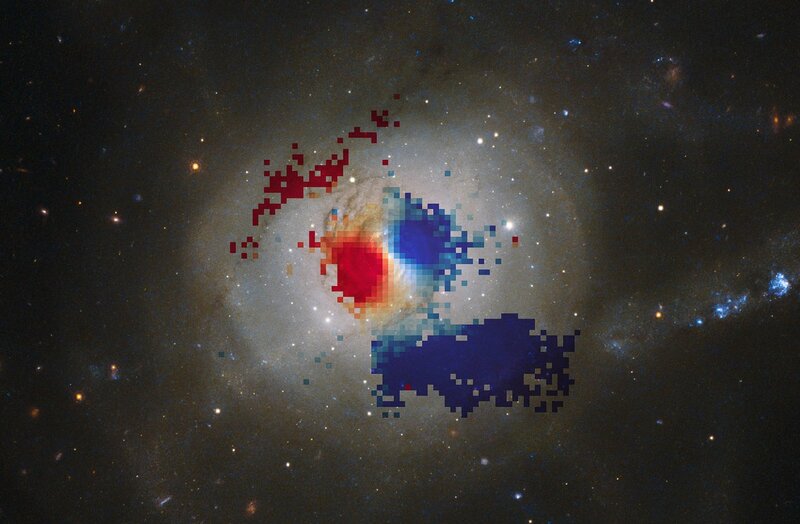 Using the VIsible Multi-Object Spectrograph (VIMOS) instrument on ESO’s Very Large Telescope, astronomers were able to measure the movement of the gas within this disc, allowing them to map its rotation. Red regions indicate gas moving away from us, and blue regions towards us. Together, these colours reveal the galaxy's steadily rotating centre, as well as highlighting two flowing streams of hot gas north-west and south-east of the central region. Past studies suggested that the central spiral was rotating counter to the rest of the galaxy, but by comparing the movement of stars around the galaxy with the gas ionised by newly formed stars in the minispiral, we now know that they are in fact rotating in the same direction. Such a detailed map is possible due to the Integral Field Unit (IFU) on VIMOS, allowing astronomers to study the gas in NGC 7252 with a comprehensive "mosaic" view. Much like the way a fly observes the world, an IFU divides its subject into many cells, or pixels, generating a spectrum for every single one. The resulting information is arranged into a 3D data cube, which is particularly useful in studying extended objects in just one shot. Using the slider, this new VLT map can be overlaid on an older image from the NASA/ESA Hubble Space Telescope, matching the galaxy’s visual beauty to its complex inner workings. ESO/ESA/Hubble & NASA/J. Weaver et al.